OmniPage Ultimate is the fastest, most precise way to convert paper, PDF files and forms with amazing accuracy into files you can share, edit on your PC, listen to with natural speech, or archive in a document repository. Superior accuracy and formatting and easy-to-use workflow technology automate all your conversion needs. Whether you want to eliminate paper, create searchable PDF files, collect data from forms or automatically send documents to others, OmniPage is up to the task. OmniPage provides the speed, quality and features making it the perfect choice to save valuable time, reduce costs, get the most out of all your scanning devices and increase productivity for everyone. If you are upgrading from OmniPage Professional 18, you benefit from the following innovations. OmniPage is the hallmark in document conversion accuracy and continues to improve with every new version. 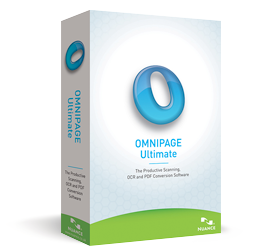 OmniPage Ultimate delivers, for example, an astounding 25% increase accuracy for digital camera images. Layout conversion also continues to improve to faithfully reproduce your documents in a variety of output formats. OmniPage is all about saving you time and it just got faster, easier and more convenient. The Launchpad application opens in less than a single second. Before you even have time to react you will have the full power of OmniPage conversions at your fingertips. Now the fastest way to convert any kind of documents and send to any destination is by clicking on action buttons in the revolutionary tablet like Launchpad. How many applications give you that kind of power in so little time? Document scanning and routing now supports Microsoft Server environments. OmniPage DocuDirect is the perfect low cost solution for occasional document scanning, conversion and document routing for small businesses or workgroups that share a scanning device. It allows you to get the most out of low volume scanning devices like some digital copiers, MFPs, and All-in-One devices that have limited document conversion and network document routing capability. OmniPage DocuDirect can be installed on a network server or shared computer that is connected to one of these devices and can automatically send converted files to a predefined single destination, multiple destinations or on-demand to anyone, anywhere using barcode workflows created with the OminPage Workflow Assistant. PDF files are everywhere and can come from a variety of sources. They can include scanned pages, embedded images, and other types of information. Some of these elements don’t include searchable text but it’s not obvious just by looking at a PDF and therein lays the problem. Using a typical OCR process on text based PDF files can unintentionally destroy text element in order to create a Searchable PDF format that is a PDF Image file with a text later. To solve the problem of creating Searchable PDFs from files on disk without having to inspect them we created the eDiscovery Assistant for searchable PDF in OmniPage 18. This process intelligently analyzes PDF files of all kinds and determines only those PDF files, or pages in a PDF file that require an OCR process. We have migrated this very p[productive functionality into OmniPage DocuDirect so the process can be centrally located using a watched folder on a server and handled automatically.